DriverDave had the most liked content! That is my plan for this year's winter project...along with sending my suspension to Daugherty Motorsports for the standard upgrade. I have the Helibars on mine (though I never rode one with stock bars). I'm quite happy with them. Any News of a 2019 new model??? 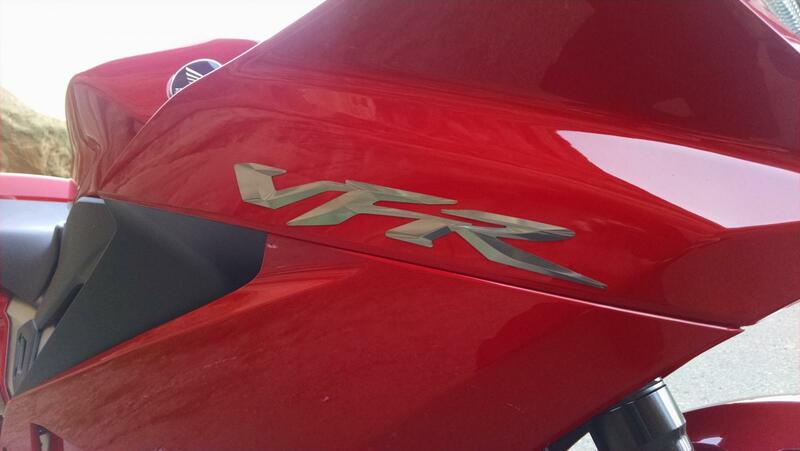 The US only got the 2014 and 2015 VFR800F/D models. You have to go to another country to find a 2016+. Same goes for the VFR1200F, we only got 2010, 2012, and 2013. I saw you in Sedalia! I was out putting miles on my new Velvet Red Jeep SRT. PCV and ZBomb and De-Cat? Or just have Guhl tune it? So did you find a good technique to remove those tank covers? I had found a good video for the main fairing removal. I haven't even done mine yet, but I fully recommend the Guhl flash. I plan on getting the http://daughertymotorsports.com suspension work done as well. My very first new set of tires on this bike were PR4s that only lasted 4000 miles. Didn't like them for the second half of their life. Speaking of Bridgestone, if anyone needs a set of tires and doesn't have a lot of money to spend, you can get a set of BT023s for $211 delivered from Jake Wilson. And there is a Bridgestone rebate offer going on through the end of the month...$35 per tire. That's a total net cost of only $141 for a set of good quality sport touring tires. It will be interesting to see how they compare to the T30 EVOs I ran two sets ago. Only got 2400 miles out of those, but they felt great. They weren't bad when new, but once I passed 2000 miles, they really started to wear uneven and started to feel pretty crappy. I think I only got about 4000 miles out of them. Unless you do a lot of rain riding, I don't think the PR4 is that great on a VFR. I like the Dunlop Roadsmart line and the Angel GT the best. Worst tires I ever had! Never again. Just for reference, I will give you the quick rundown on all my tires over the last 7 years and 55k miles on a 6th gen and 8th gen: (these are all full-on sport touring tires designed for a very sporty long life) Michelin Pilot Road 2, PR 3, and PR4. Dunlop Roadsmart, RS2, and RS3. (twice ran the RS and RS2, currently on the RS3) Pirelli Angel St and GT. Bridgestone T30 EVO. (no 'b spec' or heavyweight versions ever used) Always ran matched sets in stock sizes at 2-4 below recommended PSI. Most tires replaced at about halfway down through the wearbars. Never showed cords or squared off profile. It would seem that I've grown to prefer the Dunlop RS over everything else, and will stick with them for the foreseeable future. The Pilot Road line has generally gotten worse with each new version. Best mileage was the PR2, PR3, and all RS, with 5k to 6k miles...worst mileage was the T30 EVO at only 3k. They all handle great when new, with the PR4 falling off first, at less than 2k miles in, and the RS line being the most consistent to the end. The only other model I'd be interested in trying is the Metzeler Roadtec 01. All of my riding is in the mountains of Colorado on sunny days, at a very spirited pace, simply for the sheer joy of it. If I pushed any harder than my usual pace, I would probably want to switch over to full supersport tires for safety reasons. As efficient as I have become at pulling my wheels off and taking them down to the local shop to get some new tires slapped on, I would rather not do it any more than I have to! BTW, I'm now 850 miles into my first set of RS3, and I couldn't be happier. Really hammered the last 2 rides, feeling planted and confident the whole time. I've run the Angel GT. They are a good tire, and if you ever do get stuck in the rain, you will be very happy with them. The only issue I had was their life span, but I generally have that problem with every tire I try. I only got 4000 miles out of my GTs. But then again, I've never gotten more than 5500 from any sport touring tire. I'm hoping for at least 5000 out of my current Dunlop Roadsmart 3's I just put on. You're upset about getting 7k miles from a single compound tire? I only got 3k miles out of my OEM 222s! You should try the Roadsmart 2 or new Roadsmart 3. Both are dual compound and should fair much better with all of your commuting. (the RS2 is basically the same tire as the D222, but with dual compound) My last set was the Bridgestone T30 EVO and their life sucked...only about 3500 miles. I typically only get 5k-6k out of a dual compound ST tire. (I'm a serious canyon carver, so I always wear out the sides before the middle). I've run the RS2 twice and now have the RS3 mounted. I have no plans to ever try Bridgestone again. Standard is fine unless you spend most of your time riding 2up. And the FJR is about 100 lbs more than the VFR. What kind of Oil/Filter do y'all use? Once I had a K&N fail, I used the HiFlo many times with no problems on my 6th gen. Been using OEM on the 8th gen (service contract with the dealer).